Chimeric Human IgE anti NP antibody clone JW8/1 (MCA333S) used for stimulation of LAD2 cells-in vitro followed by evaluation of β-hexosaminidase activity. FcR-dependent functional activity in primary human immune cells is inhibited by CC-509. When stimulated through the indicated FcR, CC-509 inhibits functional activity in (A) primary human macrophage, (B) primary human B-cells and (C) the LAD2 human mast cell line. 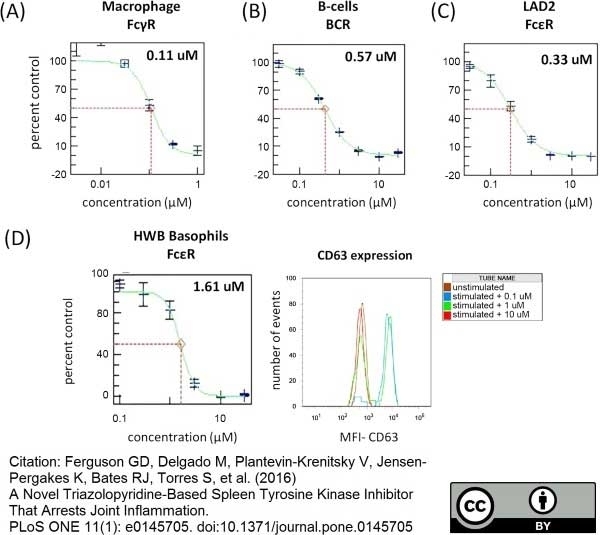 (D) Left panel: CC-509 inhibits CD63 upregulation on basophils stimulated through indicated FcR in human whole blood. Right panel: Representative flow-cytometry plot showing the number of events and CD63 mean fluorescence intensity (MFI) on unstimulated (brown trace) or stimulated basophils in the presence of 0.1 μM (blue trace), 1.0 μM (green trace), or 10.0 μM (red trace) CC-509. IC50 values (μM) are indicated in upper-right portion of each panel. All data expressed as percent of DMSO-treated control, mean ± SD. A Novel Triazolopyridine-Based Spleen Tyrosine Kinase Inhibitor That Arrests Joint Inflammation. The immunoglobulin heavy chain has been produced by the linking of the antigen-binding, variable region genes of a mouse hybridoma to human constant region genes by in vitro DNA recombination procedures. The resulting chimeric antibody is subsequently expressed by the myeloma cell-line J558L after transfection. (The J558L cell-line self secretes a lambda light chain but no heavy chain). Thus a chimeric human IgE antibody specific for NP has been produced. Plasmids containing chimaeric heavy chain gene were fused with cells of the J558L mouse myeloma cell line. 1This product contains sodium azide, removal by dialysis is recommended prior to use in functional assays. Dialysis cassettes EQU003 are suitable for this purpose. Neuberger, M.S. et al. (1984) Recombinant antibodies possessing novel effector functions. Sayers, I. et al. (2004) The importance of Lys-352 of human immunoglobulin E in FcepsilonRII/CD23 recognition. J Biol Chem. 279: 35320-5. Neuberger, M.S. et al. (1985) A hapten-specific chimaeric IgE antibody with human physiological effector function. Sallmann, E. et al. (2011) High-Affinity IgE Receptors on Dendritic Cells Exacerbate Th2-Dependent Inflammation. Xu, D. et al. (2012) RN486, a selective Bruton's tyrosine kinase inhibitor, abrogates immune hypersensitivity responses and arthritis in rodents. J Pharmacol Exp Ther. 341 (1): 90-103. Vangelista, L. et al. (2005) Membrane IgE binds and activates Fc epsilon RI in an antigen-independent manner. Kulka, M. and Metcalfe, D.D. (2004) High-resolution tracking of cell division demonstrates differential effects of TH1 and TH2 cytokines on SCF-dependent human mast cell production in vitro: correlation with apoptosis and Kit expression. Novak, N. et al. (2003) Evidence for a differential expression of the FcepsilonRIgamma chain in dendritic cells of atopic and nonatopic donors. J Clin Invest. 111: 1047-56. Sawada, J. et al. (2005) Stem cell factor has a suppressive activity to IgE-mediated chemotaxis of mast cells. Ferguson, G.D. et al. (2016) A Novel Triazolopyridine-Based Spleen Tyrosine Kinase Inhibitor That Arrests Joint Inflammation. PLoS One. 11 (1): e0145705. Shirley D et al. (2016) Resveratrol preferentially inhibits IgE-dependent PGD2 biosynthesis but enhances TNF production from human skin mast cells. Biochim Biophys Acta. pii: S0304-4165(16)00015-5. Troupin, A. et al. (2016) A Role for Human Skin Mast Cells in Dengue Virus Infection and Systemic Spread. J Immunol. 197 (11): 4382-4391. Bratke, K. et al. (2017) Differential regulation of PD-1 and its ligands in allergic asthma. Clin Exp Allergy. 47 (11): 1417-25. Biochimica et Biophysica Acta (BBA) - General Subjects. [Epub ahead of print].